Teach puppy not to bite by saying “Ouch” loudly. Puppies are naturally excited little creatures with an abundance of energy. When they have been restricted like in a kennel – they need to be taught to wear off their energy while being gentle. They may jump up, scratching with their claws as they do. Or they may get overly excited while playing and bite too hard. The best method I have found for stopping this – is using the same way dogs tell each other when they are getting hurt. In a high voice – like a dog’s yelp say: “Ouch.” Most dogs will stop and look at you – understanding that you are hurt. Very quickly they connect their actions with you getting hurt. Repeat this every single time they get too carried away. Puppies jumping up is cute at first, but you must consider how big the dog will become. And jumping up for any dog during muddy weather is not desirable. So it is best to “yelp” to stop them from jumping up at all. Don’t give them affection while they are jumping up. Instead reach down to interact with your pup. They soon learn they only get attention when they stay down. If you have children, teach them also to be gentle with the puppy. Puppy can also get hurt – and will yelp to tell you. If they are hurt badly or often, they may defend themselves. 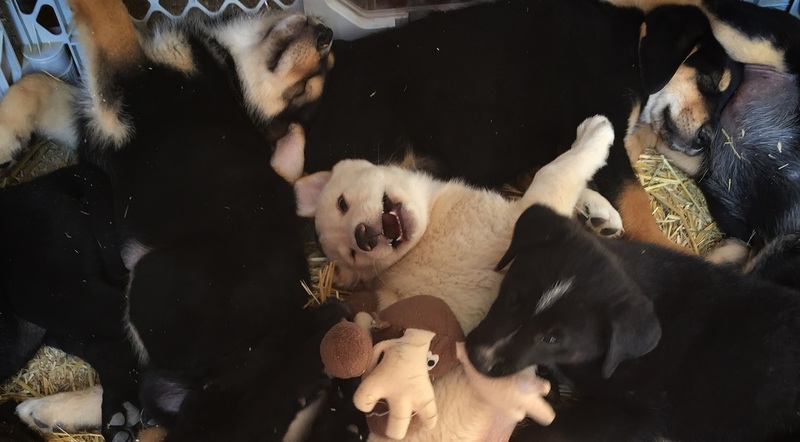 – Cheryl @ Yukon Animal Rescue Network – YARN Nursery.